UAE-based Al Farwaniya Property Developments said work on its $1.2-billion Abu Dhabi retail, dining and leisure destination, Reem Mall, is progressing at a rapid pace with more than 163,500 cu m of reinforced concrete already cast in place. The construction for the project commenced in late 2017, with the foundation stone laid earlier this year. As of October, a total of 16 tower cranes have been erected at the project site, said the developer. Al Farwaniya Property Developments is a joint venture between three Kuwait-based companies: Agility, Agility affiliate United Projects for Aviation Services Company (UPAC), and National Real Estate Company (NREC). Together, these three bring a sound financial base, extensive experience in asset management and commercial real estate development, and a successful track record of mall operations for the mega-mall project. The Reem Mall site is located in the Najmat District on Reem Island and is part of the residential and commercial master development by Reem Developers. On completion, Reem Island is expected to have a population of 200,000 people. In line with its commitment to promote industry-leading health and safety standards, Al Farwaniya Property Developments has launched a unique awards programme for its staff and contractors. 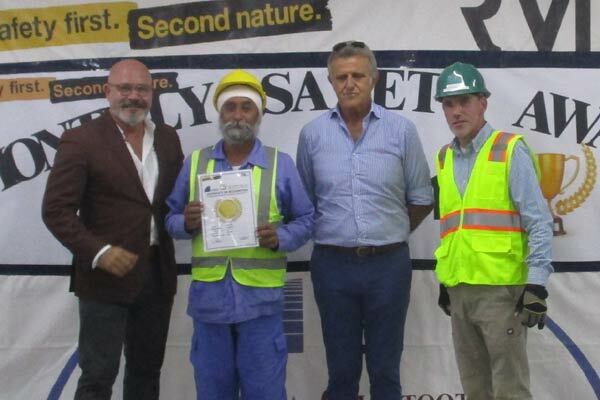 The Reem Mall Health and Safety Awards is a new platform that showcases the importance of safe building practices to the contractors, consultants, company employees and site workers involved in delivering the ambitious UAE project. The initiative will see an award and prize presented monthly to a worker in recognition for showing outstanding commitment to health and safety standards, or for directly contributing to the health and safety of their colleagues, said the developer. In addition, the project runs a series of monthly rewards programmes such as the group award, which recognises safety awareness in teams, it added. Maintaining the highest health and safety standards is a key priority for Reem Mall developers as construction on the major retail and leisure destination continues to progress at a rapid pace, it added. CEO Shane Eldstrom said: "At Reem Mall, the health, safety and welfare of our workforce is given the highest priority, and the new awards initiative is an important part of our commitment to the highest industry standards." "From the very start of the project, we have been working with a specialist health and safety consultant, 4See, to oversee the health and safety directly on behalf of the employer," stated Eldstrom. "Working together with our main works contractor, Itinera Ghantoot JV, we have implemented a number of unique health, safety and welfare initiatives such as a 24-hour medical clinic, a 2,000 worker cool room to provide relief from weather conditions and a dedicated facility on site for ongoing safety training for workers, sub-contractors and staff," noted the top official.